Editor’s note: The current issue of Quality Assurance in Education is a special one, devoted entirely to exploring seven different improvement-based approaches to change being used in schools. Over several weeks, beginning February 23, the Carnegie Foundation will publish a blog post summarizing each of the models, including the process, examples, and pros and cons. “Six Sigma in Education” is written by Paul G. LeMahieu of the Carnegie Foundation; Lee E. Nordstrum with RTI International; and Elizabeth A. Cudney of the Missouri University of Science and Technology. We hope that these summary blog posts will whet your appetite to delve more deeply into the journal itself. The overarching goal of the improvement approach known as Six Sigma is to reduce variance in outcomes by using data and statistical methods to improve system performance. An engineer at Motorola first developed (and later trademarked) Six Sigma in 1986 as a quality control measure. The company wanted to improve its manufacturing and inspection processes, which, at the time, did not adequately detect and correct defects. The term is derived from the 18th letter of the Greek alphabet (σ). In statistics, sigma refers to a standard deviation, so Six Sigma is six standard deviations, signaling an event that has a .0000035% chance of occurring (or 1 out of 285,715 events) — an admirable goal for maintaining a defect free process. When Motorola University — the company’s internal training system — began offering Six Sigma courses to external audiences, the approach spread to other companies (notably including General Electric in 1995). Much of the terminology of Six Sigma is based on business and manufacturing, and, because it’s still fairly new, the approach hasn’t yet had widespread use in educational systems. Adams CSD also turned to Six Sigma to figure out why standardized tests were suggesting inconsistent performance among the district’s high schools, a situation that posed a significant worry at that time due to the accountability regulations of the federal No Child Left Behind act. A team of high school teachers using Six Sigma tools found the problem stemmed from the district’s practice of allowing each high school to select its own textbooks, “which introduced variation in what children were taught and, consequently, learned,” write LeMahieu, Nordstrum, and Cudney. Adams ran a two-year pilot program giving all ninth and tenth grade students the same textbook and curriculum. At the end of that time, the students were all learning the same material making standardized test results quantifiable across the district. Unlike the Networked Improvement Model (also examined in the special issue), Six Sigma does not have formal mechanisms for using knowledge gleaned from one project to inform future projects. Each project team decides whether or not to access earlier improvement records. Successful strategies implemented throughout a company become the basis for future improvement work. Six Sigma provides many tools and techniques that rely heavily on the formal training of individuals who use it, which can be a drawback. Many companies have created teams of Six Sigma experts whose full-time job is to lead Six Sigma projects. The central tool is the five-step DMAIC (define, measure, analyze, improve, control) roadmap, pictured here and discussed in greater detail below. 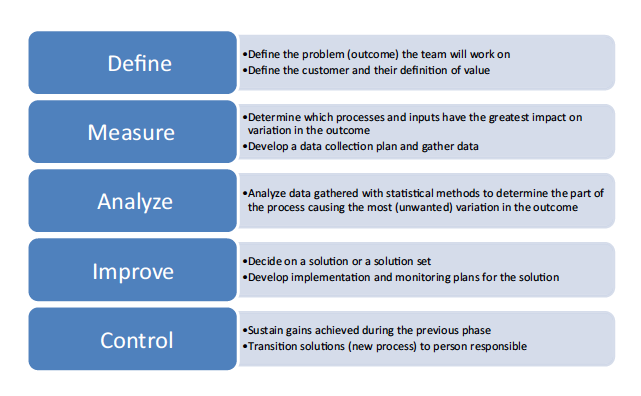 Six Sigma in Action: What’s the Problem? The Six Sigma approach identifies and prioritizes problems in response to customer needs. The method’s goal is to understand and control variation in an organization’s work processes, which are caused by the “six M’s”: materials, method, machines, manpower, measurement, and mother nature. Issues to be addressed can be categorized as: decreasing unreliability in processes; eliminating waste; identifying and decreasing the incidence of defects; reducing costs of processes; and improving customer satisfaction. These were the issues hampering efforts to improve Milwaukee schools in 2011, when the Greater Milwaukee Foundation created Milwaukee Succeeds. Many groups were trying to help, but weren’t working together, placing the education community in the anomalous position of being program rich and systems poor. Designed as a collective-impact organization, Milwaukee Succeeds uses Six Sigma (in conjunction with other quality improvement approaches) to work toward providing a quality educational experience for every child from infancy to young adulthood. Milwaukee Succeeds unites nonprofits, schools, community groups, and government agencies around four topical networks based on common goals: School readiness, third-grade reading, postsecondary and career readiness, and community and social support. Solutions come from the Six Sigma team, a small group that works on the improvement project full-time for a period of months. Team members are assigned responsibilities according to their level of training. A Six Sigma Black Belt — well-versed in the Six Sigma method — leads each team. The Milwaukee Succeeds topical networks, for example, are led by coaches with six months of training. The improvement team often includes one or more Green Belts (those with some training in the method) as well as others with expert knowledge on the organizational process that needs to be improved. Each team also has a senior management champion, whose role is to advocate for the project. The diversity of perspectives on the team — which includes someone with expertise in understanding what customers (students) want and need — is purposeful and is meant to enrich the identification of possible solutions. Potential solutions arise during the define, measure, and analyze phases of the DMAIC roadmap. The team then decides which solutions to test, doing so on a small scale and multiple times under various conditions. The Six Sigma toolkit includes resources (many of them statistical methods) for analyzing the test results. Changes that are deemed improvements are then handed off to the workers who are responsible for the (now improved) process. The third-grade reading network in Milwaukee Success has piloted workshops — now led by parent coordinators — to teach family members how to better support their child’s reading. Using Six Sigma, the reading network has also been testing coordination meetings between different types of coordinators based on their backgrounds, such as whether they work in school-based or community-based contexts. During the control phase of the DMAIC roadmap, the improvement team transfers what it has learned to colleagues who will sustain the work. Regular meetings between the team, team champion, and organizational management facilitate this sharing of knowledge, as do Six Sigma tools like the stakeholder analysis chart (which diagrams attitudes and support levels of stakeholders). The Six Sigma approach is a resource-intensive one. It requires a group of trained improvement team members who are able to devote much (if not all) of their time to what are often months-long improvement projects. Perhaps for that reason, and perhaps because the method is heavy on statistics and manufacturing-based language, the approach is not yet used much in the education sector. However, its focus on data analysis is likely to be quite familiar to educators who are increasingly expected to use data to improve instruction. Additionally, Six Sigma prizes the perspectives and needs of clients to a considerable degree, which aligns well with the ultimate goal of education to serve students, families, and communities.